Thank goodness I am wearing boots, because otherwise, when I am knee-deep in the thick, gloppy mud in the humid and overcast afternoon, my foot would come shooting out and cause me to face plant it into the neat little rows of grass we are planting. Our afternoon volunteer activity is another labor-intensive experience. This time, we have are split into two groups: grass planters and sugar-cane choppers. I’ve had my fill for life of machetes, so I opt to spend time hunched over a mud field, shoving little grass bulbs into holes. As we walk to the field, Jack points out spots of interest, namely the moon bear Lek’s husband has rescued. This little, fluffy guy was having his bile harvested when he was rescued. I squint my eyes to a platform in a large, fenced off area and see the bear, a roly poly fella, hanging out, draping his head off of a platform, looking at the world upside down. We finally arrive to our field, nearby Lilly’s grave. It’s roped off with stakes and string. And, it’s pretty big. Jack hands us each bundles of grass to plant, explaining he will come by and poke a hole in the ground where the grass goes, to put one piece in, then cover it up with more dirt. Then, when the row is done, we move back a fraction of an inch (not literally, but it seems like it), and do it all over again. With 10 of us, we each cover about 10 holes in the ground before we retreat a row back. Only, Lucy, Katy and I have it a bit harder. 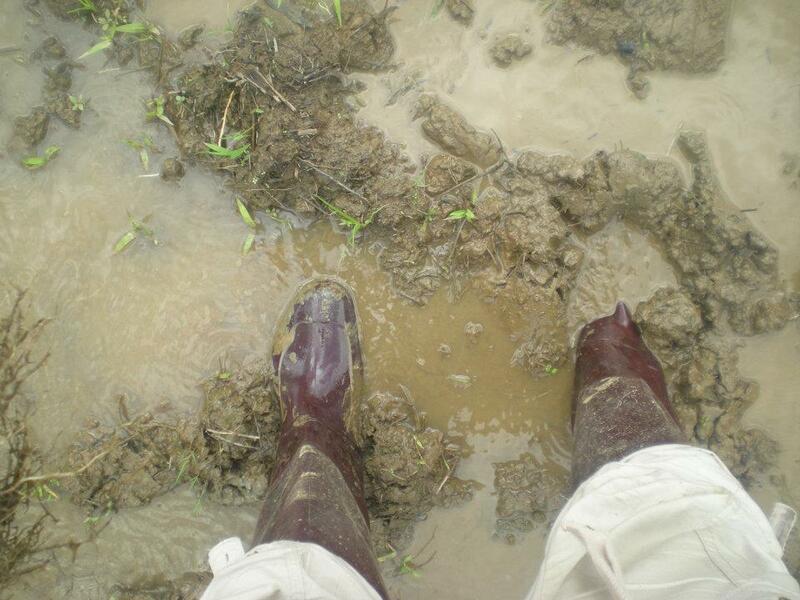 We’re off to one side of the field … pockmarked with huge puddles. First, it’s Jack who comes up to me, hand covered in mud, and runs his finger down both cheeks and my chin, leaving me with swipes of mud that look like I’m at some ancient tribal ritual. Then, as we move further and further into the puddles, my hands, then arms, become covered in it. We don’t even need to poke holes in the earth anymore. I simply jab my finger into the ground, shove a piece of grass, then slosh some water and dirt over it, hoping the grass doesn’t get up and float away. We get into a good routine. Grass in one hand. Popping our fingers down into the mud, shoving a piece in, covering it. Repeating down the line until we reach our neighbor’s planted grass. Then, step back a foot into more mud, and do it all over again. “We should sing!” Lucy suggests. When there is no audible groan from the volunteers, she launches into song. Then, we begin to throw out suggestions. “How about some New Kids on the Block?” I ask after they run through some songs from the early 90s. Lucy and Katy pause mid-plant and look at me. Oh my god. They don’t know New Kids on the Block. “Ya know … Hanging Tough … Step by Step, oooh baby,” I sing. They stare at me, blankly. Then it hits me, I am old. Well, not old. But, significantly older than the two girls who are standing next to me. Turns out, Katy isn’t even 20, and Lucy is in her early 20s. And, me? Well, I’ve got a good decade on Katy. Instead, we sing Backstreet Boys. Well, they do. I don’t know enough of the words. Oh, beautiful generation gap. From time to time, one of the three of us has a near splash in the mud. Our gumboots become firmly entrenched. No one notices until one of us — the stuck one — squeals and tries desperately to not land on all fours in the huge puddles. We wave our hands, lurched over and teetering, attempting to regain our balance. Sometimes, our feet actually become dislodged within the boot and creep dangerously close to falling out. Fortunately, we always recover, getting our foot back into the foot portion of our boot. When we run out of grass to plant, I’m actually kind of bummed, although I am thankful I won’t be having ants creep out of the strands and crawl up my arms anymore. The three of us actually make it out of planting grass without landing in the mud. He gets Lucy and Katy first. I smugly step aside, avoiding the throw down. But then, as I walk towards the solid land, he tackles me, sending my entire right side plummeting into a huge mud puddle. I can’t help but laugh and be giddy. Being caked in mud doesn’t even bother me because we’re having so much fun. As we walk back, Lucy, Katy and I link arms, giggling about our afternoon as our feet squish into the ground, I realize I like planting grass. I like this entire experience so far. But still, nothing can surpass the shoveling. Nothing … except MORE shoveling!!! Sometimes a girl just has to get dirty!!! Oh yeah! I was so amazed at how far I came from the beginning of my trip to the end. I definitely got a lot less girlie! And super dirty! It was a really fun time! And no, you’re right, NKOTB aren’t THAT old. It could have been worse … we could have been comparing Beatles to Bieber. OH yeah. Sugar cane? No thanks!! Heh… you’re old! That made me LOL. It never fails to surprise me to learn that my 10-year-old daughter doesn’t know who certain people are, like Madonna. This sounds like a cool voluntourism experience, but where were you? I’ve read a bit about moon bears, but cannot for the life of me remember where they’re from. I don’t know if I would say “old” old, but I am not in my 20s anymore. I was at Elephant Nature Park … I’m in the middle of writing a series about my experience as a volunteer there. Moon bears are Asian bears, but I can’t really speak on them, other than I know in some countries, their bile is harvested. That does not sound very appealing for me! I hate ants! Me too! Ants and spiders. Freak. Me. Out. I am LOVING all of your elephant adventures – seriously hanging on every word, can’t wait for the next installment. It just sounds like such a fun experience while at the same time obviously being emotional and meaningful. Lucy Love!!! I am so glad you found the post! I did leave out the part where I was seething with jealousy because you went into the river! BSB is NOT an English band!! Are they?!? I always blame everything on my being old. I will keep the posts coming. I miss your face so much and can’t wait to catch up with you over in the UK. Cause, yup, I’m coming to visit. LOVE YOU. I am new to your stories but I am loving them. This looks like fun and you were doing something important at the same time! Aww, thank you! The entire week was fun. And challenging. Mixed with a little sad. But, amazing! 🙂 I love your stories, too! You have no idea how old it makes *me* feel that New Kids on the Block is old people’s music… Westlife, too, apparently, now has classic status.